When Natalie Closner Schepman asked her two sisters to sing backup vocals on songs she’d written and had been performing at local coffee shops, she had no idea the decision would be so life-altering. Schepman’s small shows—was going to be something bigger. 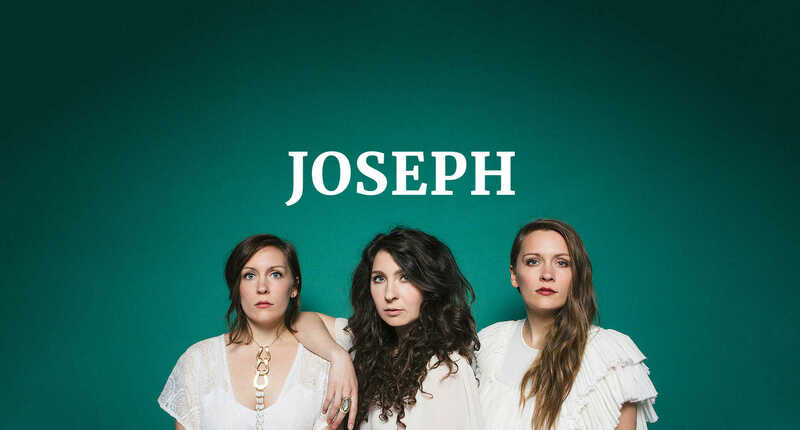 If you hear Joseph’s music, it’s clear what Schepman means when she calls it “a different thing.” Yes, there are still elements of folky, personal singer-songwriter confessionals, but their sound and songs have evolved into something totally unique. It’s a mix of pop, folk and indie-rock that brings big emotions to sincere lyrics about relationships, life and growing up. Take their breakout single “White Flag” from their 2016 album I’m Alone, No You’re Not. Leading up to the massive chorus—which culminates with the sisters sing-shouting “Burn the white flag!”—Schepman sings, I’ll sing a marching song and stomp through the halls louder than you. It’s not just a pop song: It’s a proclamation. Schepman is a Christian, like her sisters, and although they’re not “Christian musicians,” you can still hear the hope in their music—the way their faith makes it buoyant. Schepman says these “hopeful, anthemic, triumphant” songs connected with audiences early on, along with their tendency to wear their emotions on their sleeves, and embrace authenticity rather than irony. There’s a reason why the band’s music sounds so different than anything on the pop landscape—and why their authenticity-over-image approach to the creative process is so unique in the world of irony-drenched indie rock. Joseph’s origins weren’t contrived in Nashville studios or New York nightclubs. The sisters came into being a band with so few expectations that it took an unexpected force to actually push them to try to make their dream into a career: their parents. It was solid advice, but it also shows how closely their music is linked to family. The sisters grew up in the Pacific Northwest, and would frequently visit their grandfather Joe, who’d take them camping in his small town of Joseph, Oregon—a name they would later take in tribute to him. When asked what sets them apart from the multitude of other acts currently popping up in the PNW like wildflowers, Schepman answers, “The thing that we nerd about is the harmony. That’s definitely the thing that’s our strength.” On the surface, she’s talking about the stirring vocal effect the three sisters are able to achieve together. But it’s their family harmony—the chemistry that only siblings could understand—that’s helped them refine their creative style that’s actually a strength greater than just a sound. “Even in the harder moments, when we’re like, ‘Oh my gosh. What are we doing?’ [our parents] have been the ones to say, ‘No, no, you have to keep going. You have to do this,’ and holding the vision for us,” she explains. So far, that vision has them performing at coffee shops and family restaurants in their hometown, appearing on The Tonight Show, gigs at Lollapalooza, performing on The Today Show and being a featured guest in NPR’s acclaimed “Tiny Desk” live series. But even still, the best may be yet to come for Joseph. This fall, the band released a follow-up to I’m Alone, No You’re Not, the album that has led to so much early success. They knew the seven-song extended play Stay Awake would be shouldering big expectations. It also represented a turning point. They could either re-create the sound and feel that earned them their fan base and recognition or they could continue the evolution of Joseph. At first, she says, the instinct was to try and return to the formula from I’m Alone, but they realized in order to maintain the spirit of authenticity that has defined their music from day one, doing some derivative of early songs would be a mistake. “It’s interesting how starting with that in mind only produces falsity. You know what I mean?” she says. Instead, they did what they do best: They were sincere. The resulting collection of songs is a simpler, more stripped-down version of their early work with hints of folk, Appalachian spirituals and Americana. When you talk to Schepman, she frequently mentions ideas like trusting her “inner compass”—making music industry decisions based “gut instinct” and writing songs that started with personal journal entries. It’s an idea instilled in them by their parents—to “holding the vision” and following their passion first and foremost. That ethos of being open about how you feel has gotten them this far. And whatever the next step is, that will still ring true. Because Joseph understands something about harmony: It’s all about being honest with yourself and those who know you best.